It’s been pretty cold for Texas lately. We even got a decent amount of snowfall on Christmas! Between the nippy temperatures and the vegetable challenge I mentioned in my Roasted Vegetable Rotini post, I am suddenly very intrigued by soup recipes. I came across this one from Foodie Bride and knew I had to make it. I took a few liberties, mainly because I read the directions incorrectly and because I couldn’t find the thyme in the Lazy Susan. It was still delicious. It’s only around 400 calories, has over 42 grams of protein, and will fill you up with fiber and with warmth. 1. Heat olive oil in large skillet. Cook chicken chunks, flipping them over until no longer pink. Add garlic cloves, tomato paste, oregano, flour, and red pepper. Toss. 2. Put chicken in the crock-pot and add onions. 3. 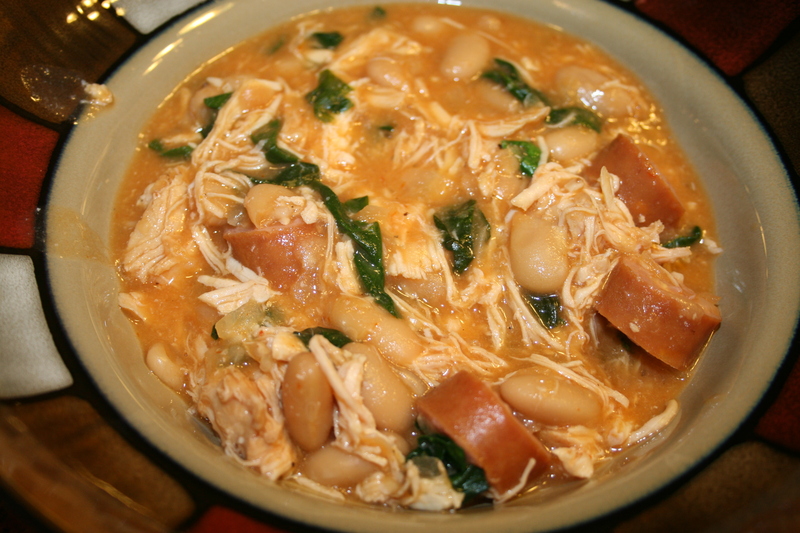 Pour in chicken broth, bay leaves and beans. 4. Cook on low for 6 hours. 5. When the stew has 30 minutes left, shred chicken chunks and return them to the broth. Add sausage and baby spinach for the last half-hour. Serve warm with dinner rolls. This is perfect for my new crockpot! I have been searching for unique recipes and this has to be one of the best ones I’ve stumbled across. I love chicken sausage! I can’t wait to make it. 🙂 Thank you for sharing!! Stay warm in Texas! This sounds delicious! 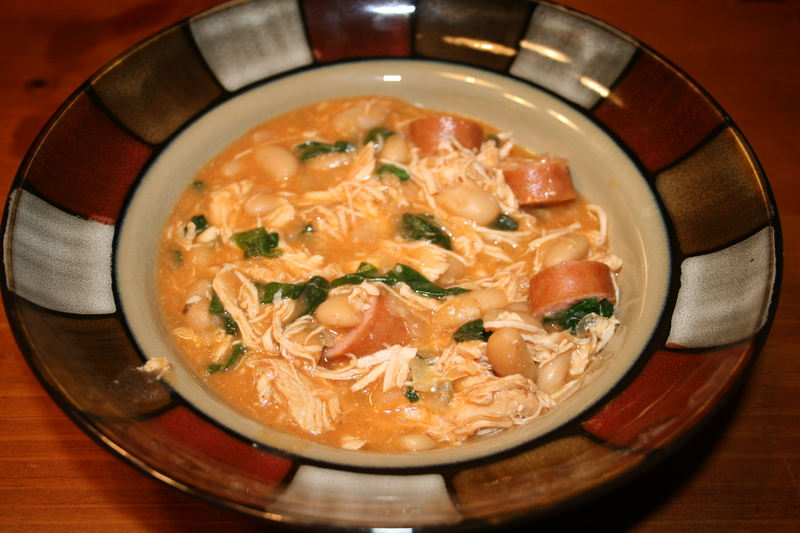 You can also make this like chicken tortilla soup.